When St. Andrew’s College embraced a wireless laptop model in 2003, we converted the whole school in one day. It was important to do this all at once to manage costs, expertise, and support to ensure an environment where teachers and students could get work done without downtime. We needed a simple model that would allow us to do our job of focusing on student learning. Teachers needed to know that every single student in their classes would be ready and able to work on their laptops. So, we catapulted ourselves from a school of desktop labs to a one-to-one model of student rented machines. This allowed us to skip a staged implementation of laptops in a few grades and stay away from unstandardized student-owned machines. 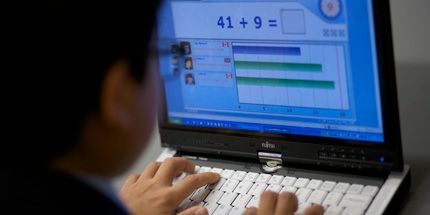 The goal was to ensure every student had access to the latest reliable and fast computer with the best software pre-installed. We adopted a program with the same computer model for all teachers and students. This cut down on support and technical issues and allowed us to focus on the unique needs of boys of different ages. Grades 5 and 6 students have their laptop use phased in over several weeks, and they are finally allowed to take their laptops with them after school by mid-October. All Middle School boarders also hand in their laptops each evening so they can get a good night's rest without distractions. With everyone using the same model, questions and support can be had from anyone in the community. A new boy can ask a returning student; a teacher can ask the class computer expert; and the middle-schooler keen on technology can ask a grade 11 student to share some of what he is doing in a computer engineering and robotics class. The middle-schooler can then show off the program he wrote for his Lego robot in grade 7 science, all on the same tablet, using applications that are available to everyone. To discover more about the our overall laptop program, click here.